Bring back childhood memories with this easy, no-bake rice krispie treats recipe! They’re extra gooey and extra buttery, and simply perfect in every way! Hey everybody! Hey you know what? I just realized something- Summer’s already nearly half over. I know. It’s kinda depressing how quickly it passes. I feel like it just barely started getting underway, but then my husband reminded me that next week is July 4 and that’s usually smack in the middle of when the kids finish up the last school year, and start the next. It’s just too much fun and it goes too fast. So I’m going to make every minute count. I’m outside enjoying the weather as much as humanly possible. I’m trying not to sweat the small stuff. I’m stopping to smell the roses, and eat the sweet, fresh tomatoes from our backyard garden. And I’m keeping desserts as easy, quick, and no-bake as I can. 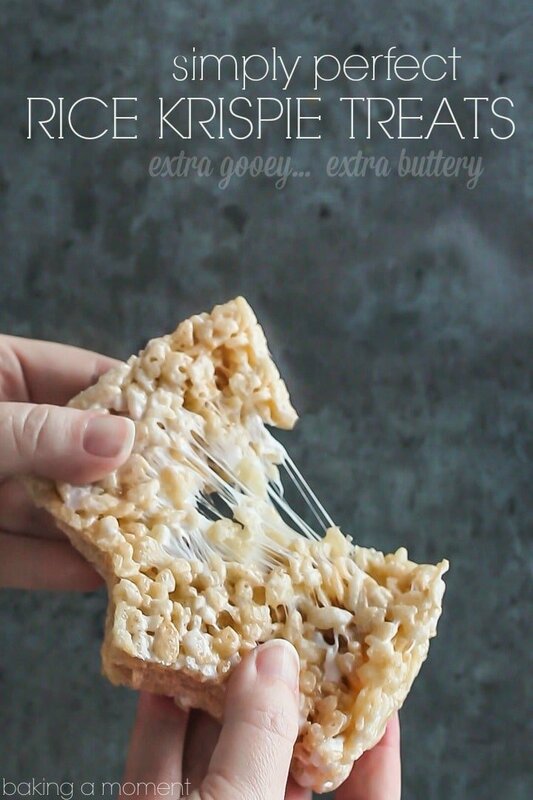 Rice krispie treats are a great way to do that. They’re a total classic, you can’t help but smile when you have one, and they whip up in a snap. I made these bars in less than 10 minutes without even breaking a sweat, and they were simply perfect in every way. 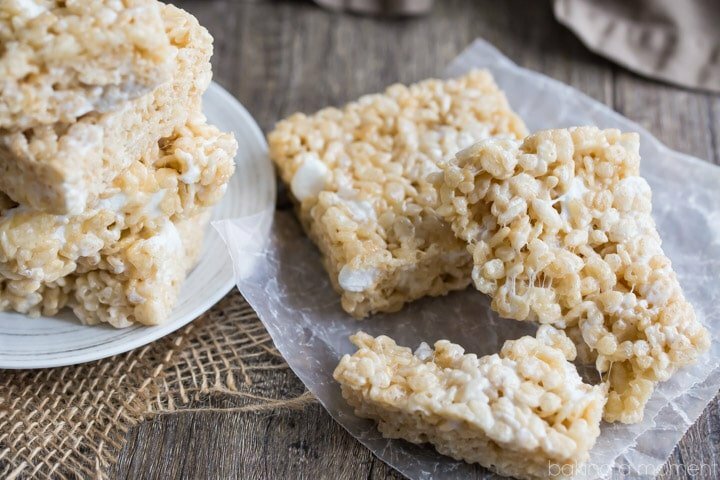 When was the last time you made rice krispie treats? I’m guessing it’s been way too long. It was for me. Sure, I sometimes buy the pre-packaged ones for my kids’ lunchboxes, but they truly don’t hold a candle to this recipe. Every time I make a batch, I marvel at how incredible they taste. So buttery, sweet, and gooey, so light and crunchy! You can make the recipe from the back of the box, or you can try it my way. It’s every bit as simple, but just a couple of extra ingredients take them to a whole different level! 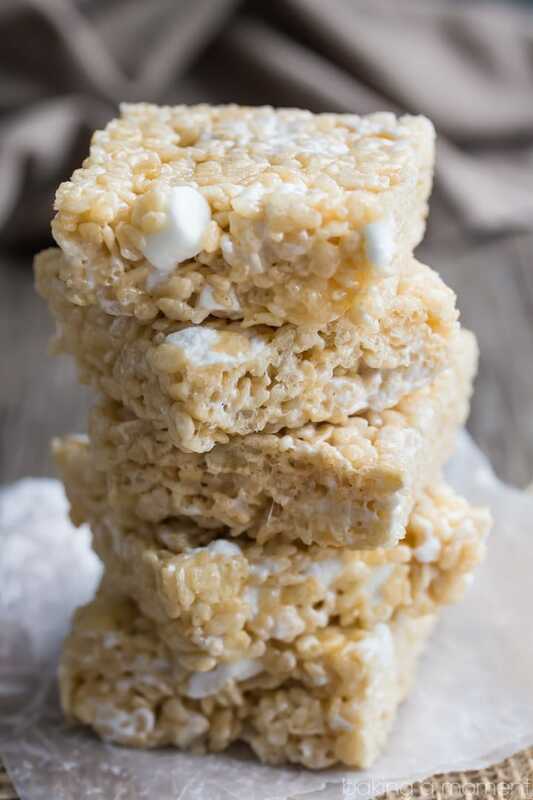 I like my rice krispie treats extra gooey, so for this recipe you are going to stir 5 cups of mini marshmallows into the butter/rice krispie mixture, and keep another 3 cups aside to stir in once things have cooled a little bit. This way, you get nice big pockets of sweet, sticky marshmallow running all throughout. I also like them extra buttery, so you’ll notice the butter quantity is a bit higher than what you might be used to. Don’t worry- it’s a good thing. It’s a very good thing. And finally, I’m a firm believer that a little salt goes a long way in taking desserts from good to great. In my opinion, it balances the flavors and brings out all the best in a recipe. It’s so necessary! I hope you’ll give this recipe a try! It brought back so many childhood summer memories for me, and my kids really love it too. Take a few minutes to make tonight even more special and mix up a quick batch. Lightly mist a 9-inch by 9-inch square baking pan with non-stick spray. Place 5 cups of the mini marshmallows in a large pot, along with the butter and salt. Cook over medium-low heat, stirring, until melted and combined (3 to 5 minutes). Remove from the heat and allow to cool slightly (about 5 minutes). Stir in the remaining mini marshmallows. Transfer the mixture to the prepared pan, pressing lightly with your fingertips to shape. Cut into bars and serve. Allie, rice krispie treats are one of our faves!!!!! These do look absolutely perfect! and perfect for the 4th! agree on keeping desserts easy, quick, and no-bake for the summer and LOVE the mini marshmallows in there!!! I like to put vanilla extract in mine. I do like them sticky not dry. No store bought ones for us. Charlotte: the vanilla sounds wonderful. How much? That photo Allie! You can just tell how extra gooey they are! Perfect for summer! Don’t say summer’s half over!! Tom always says that around the 4th of July, but I try not to listen! I still savor every day like it’s the first day of summer. Enjoy the 4th! Love this simply perfect recipe! I haven’t had a rice krispie treat in ages. That must change, STAT! What makes this recipe any different from the back of a box? 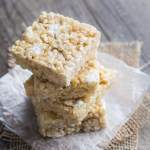 “I like my rice krispie treats extra gooey, so for this recipe you are going to stir 5 cups of mini marshmallows into the butter/rice krispie mixture, and keep another 3 cups aside to stir in once things have cooled a little bit. This way, you get nice big pockets of sweet, sticky marshmallow running all throughout. ahhhh nooo SUMMER PLEASE STAY! I’ll console myself with the most flipping perfect rice krispie treats ever! You’ve def. perfected a classic! Enjoy every minute, Kayle! Thank you so much sweetie! I must admit though that I sometimes dip them in chocolate! Can you use a 9×13 pan instead of 8×8? They do look yummy. You absolutely can Marguerite! They will come out a little flatter then. Good luck and enjoy! Thank you for your reply another thought could I double the recipe then use a 9×13? Have a great day!!!!!!!! They look amazing! What would be the right proportions if you want to make a half sheet pan? Thanks! Thanks Gloria! I would guesstimate that you’d probably want to x3 or x4 this recipe for that large of a pan. Hope that’s helpful!